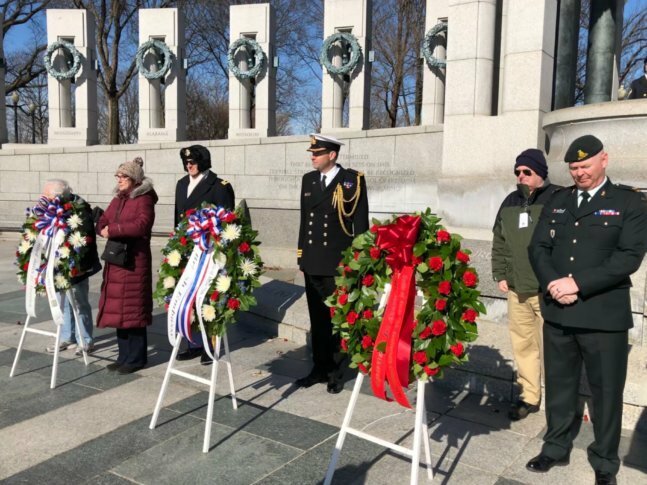 To commemorate the battle's 75th anniversary, a wreath-laying ceremony was held Tuesday at the World War II Memorial. Seven thousand were killed in the battle that ended just before D-Day; 36,000 were wounded or went missing. WASHINGTON — Voice cracking and tears flowing as much from sentiment as the cold, the daughter of a survivor of the Battle of Anzio was among those attending a wreath-laying ceremony at the World War II Memorial on Tuesday, commemorating the battle’s 75th anniversary. “I just wish that World War II veterans could be here to see this honor for them,” JoAnne Prasnick told WTOP. Veterans who had hoped to attend were unable to because of the frigid conditions. The Cleveland-area resident’s late father, Arthur G. Prasnick, was a sergeant in the 3rd Infantry Division and died in 2017 at the age of 97. “My father was an extremely incredible man among thousands of men and women who gave their lives in service for a cause that was greater than themselves,” Prasnick said. More Americans were honored for bravery at Anzio than in any other World War II battle. Twenty-two received the Medal of Honor; 7,000 were killed; and 36,000 were wounded or went missing. “Many men died on the beaches of Anzio. It took a long time to make headway, but eventually we prevailed,” said Friends of the World War II Memorial volunteer Joe Gaziano. The Battle of Anzio began on Jan. 22, 1944, and ended on June 5, 1944, with the Allies’ capture of Rome just before the D-Day invasion in France.